Want to refresh your kitchen by changing up your cabinetry? There are several options to do so, but here are two that will be kind to your stretched budget: refinishing and refacing. Refacing sounds complex, but it’s actually a simple process. 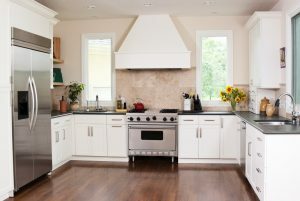 Refacing your cabinets means covering the cabinet box with a thin veneer and replacing the old doors for your new pick. They look completely different, but don’t require the same manpower or investment as installing new cabinetry. This is a great option because it’s cost-effective and eco-friendly. Many times, the kitchen cabinets are in perfectly fine condition, but they take on a worn, outdated appearance. Refacing your cabinets will allow you to match the feel of the rest of your kitchen while keeping the structural support of your current cabinets. Whether choosing traditional, country, sleek, or even French cabinets to match your Las Vegas home, there are countess options for cabinet refacing. Glazed: Gives off a charming, cottage-style feel with random distressing. Antiqued: Give your cabinets an “on purpose” vintage look. These styles are often timeless and classy. Burnished: Adds distressed detail and sanded area to create a natural look. Vintage: Reveals the natural wood grain on the cabinet edges to create a vintage look. Economical: On average, cabinet refacing costs about 50% less than the cost of gutting your cabinets and installing new ones. In most cases, the cabinets are actually in great condition. Maximize your budget by utilizing the sturdy cabinets in your home by simply refinishing or refacing them. Less Complicated: Replacing cabinets can take weeks. At ERX in Las Vegas, we take only a few days. So, if you’re not a fan of having technicians in and out of your house for weeks, consider refinishing your cabinets instead. New Look: Since refinishing your cabinets provides new colors and textures, your kitchen or bathroom in Las Vegas can take a turn for the best. Several Options: There are endless possibilities of finishes, textures, wood, and veneers. Whatever you’re searching for, there will be an option for you. Whatever your choice may be, refinishing the cabinets in your Las Vegas home is a big step. In today’s typical home, the kitchen is the place of refuge, socialization, and relaxation. If those descriptions don’t sound like your current situation, it may be time to consider updating your cabinets for a new look. Use a trusted company, like ERX Emergency Restoration to help you with the job. If you’re thinking of refinishing your cabinets, give ERX in Las Vegas a call.